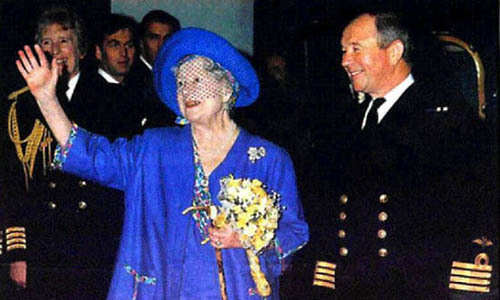 The Queen Mother visits Ark Royal - 11th November 1994. 28th January - Sail from Portsmouth to take over Operation GRAPPLE / Operation HAMDEN duties from HMS Invincible. 4th February - Rendezvous with HMS Invincible for ENCOUNTEREX and handover. 4th - 8th February - Visit to Gibraltar. February - Visit to Naples (cancelled). March - Visit to Toulon, France (cancelled). March - Visit to Bari, Italy. 31st March - Arrive in Piraeus, Greece for stand off and station leave. 11th April - Sail from Piraeus. 29th April - Visit to Corfu, Greece (at anchor). 3rd May - Sail from Corfu. 19th - 26th May - Visit to Palma, Majorca for Self Maintenance period (SMP). June - Visit to Corfu, Greece (at anchor). June - Visit to Souda Bay, Crete. July - Visit to Corfu, Greece (at anchor). July - Visit to Istanbul, Turkey. 1st - 11th August - Visit to Valletta, Malta for Self Maintenance Period (SMP) and station leave. 28th August - Handover Operation HAMDEN duties to HMS Invincible. 2nd - 19th September - Portsmouth. 21st - 26th September - Visit to Newcastle. 30th September - Families Day (at sea). October - Preparations for Extended Readiness Period. 11th November - Visit by Her Majesty Queen Elizabeth, The Queen Mother. December - Preparations for Extended Readiness Period.